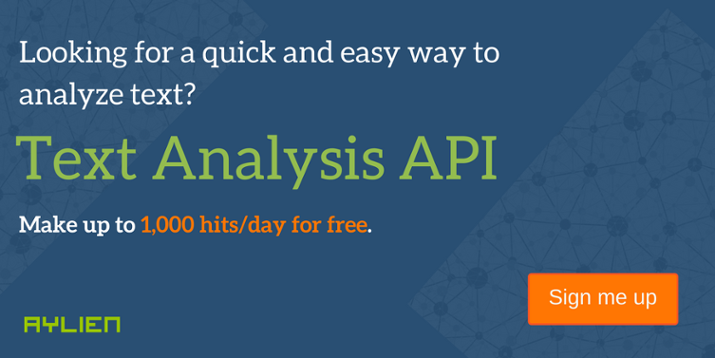 When we launched our Text Analysis API back in February, we made a promise to put quality before quantity – meaning that we won’t build a new feature without making sure the current features are all working reasonably well. That’s why we initially focused on English as the only language supported by the API. Now we’ve reached a stage where we feel comfortable to extend our knowledge of Machine Learning and Text Analysis to other languages, and that’s why we’ve decided to add support for 5 new languages to our Concept Extraction and Hashtag Suggestion endpoints: starting today, you can extract concepts that are mentioned in documents written in German, French, Italian, Spanish and Portuguese in the same way you would extract concepts mentioned in English documents. Same with Hashtag Suggestion. Note that you can use language=auto to have the API automatically detect the language of the document for you. We are planning to eventually add support for these 5 languages to all other endpoints, so stay tuned for more!